Excessive sweating is sweating that exceeds what is necessary to cool the body down to a healthy temperature, also known as hyperhidrosis. There are two kinds: primary hyperhidrosis which has no known medical cause, and secondary hyperhidrosis which is caused by a preexisting medical condition. Sweating typically is not something to be concerned about. Usually, it is simply inconvenient or embarrassing. However, there are instances in which sweating too much is a sign of something more severe, so it’s important to know what you may be dealing with. If you’re always sweating, you should familiarize yourself with some of the common causes and learn how to stop excessive sweating. 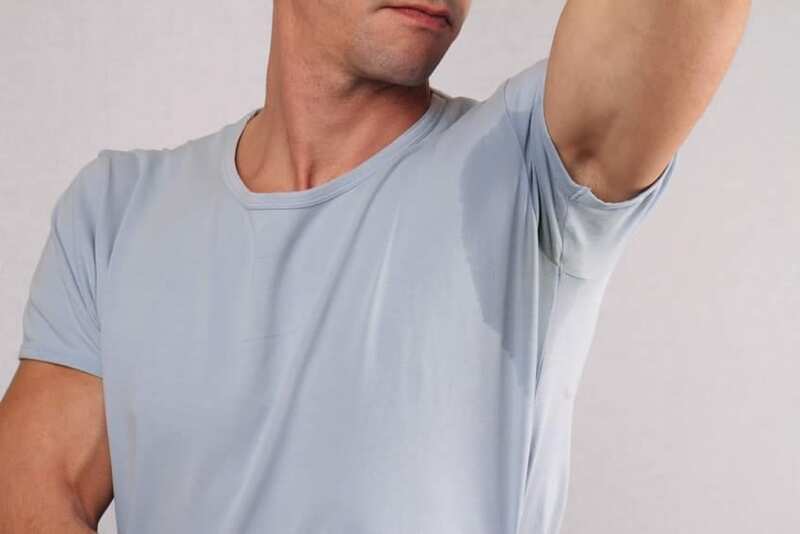 Sometimes there is no reason for excessive sweating. Primary hyperhidrosis sweating that is not linked to any medical condition, though it may be hereditary. This is the most common cause of excessive sweating. An overactive thyroid could be the cause of heavy sweating. It causes the body to increase metabolism and irregulates the heartbeat, which can result in overheating and sweating. Hyperthyroidism is easily treatable but dangerous if ignored. More accurately hypoglycemia, or low blood sugar, caused by diabetes can result in heavy sweating. This is an early warning sign of hypoglycemia and should be treated before the condition worsens to prevent seizures or a loss of consciousness. Women going through menopause often experience hot flashes. These sudden increases in temperature are caused by fluctuating estrogen levels. While they are likely to cause sweating, it is not a health concern so long as one visits the doctor regularly. Many medications list sweating as a side effect. This is commonly found in antidepressants, heart medications, and antibiotics. It is not advised to treat sweating by terminating use of medication; always talk to a doctor before stopping use. Profuse sweating is a common stress response. It is also frequently found in people with generalized anxiety disorders. While stress and occasional anxiety are normal for anyone, a persisting anxiety disorder is something that can be treated. This list does not cover all of the conditions that could cause excessive sweating so be sure to consult a doctor for your personal case. The simplest step in combatting sweat is to apply antiperspirant to the parts of your body that sweat the most. Don’t limit it to your underarms; this can also be applied to hands or feet. Try a formula that also includes a deodorant to control odor. Try a clinical strength product made to be applied overnight to up the strength. Iontophoresis is essentially a “no-sweat machine” that can help decrease sweat production. The patient will submerge their hands and feet in water filled with low-level electrical currents for about 20 minutes. This treatment can take about 10 sessions to shut down the sweat glands. From there, a few monthly maintenance treatments with an iontophoresis machine will likely be necessary to keep the sweat from returning. Botox injections are an FDA-approved way to eliminate sweating in the underarms, but can also be applied to hands and feet. The Botox is used to block the chemicals in your body from signaling sweat glands. Effective treatments can last up to a year. If other treatments haven’t worked, a doctor may recommend a prescription drug to reduce excessive sweating. Anticholinergic medicines can block the sweat glands, but be warned that the side effects, like blurred vision, may not be worth it for everybody. If the journey of how to stop excessive sweating has left one feeling hopeless, the final option is undergoing surgery. This is absolutely a last resort option. 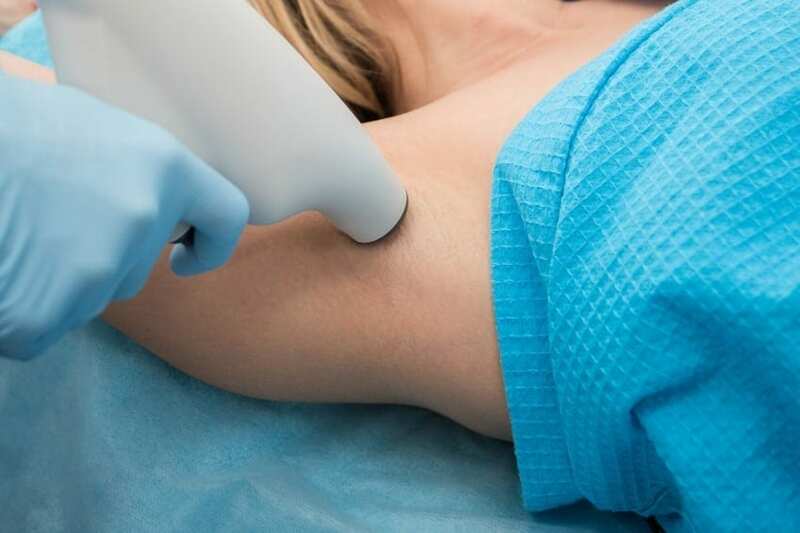 The common surgeries to eliminate sweating are for a plastic surgeon to remove the sweat glands from the underarms, or for a surgeon to remove the nerves that trigger the glands. This option should only be visited if no other treatments have worked. While there is nothing inherently wrong with sweating, it’s something that should be addressed with a medical professional. Even if there is no medical condition associated with the sweating, it can have a negative effect on one’s emotional state. The best thing someone can do is consult a doctor on how to stop excessive sweating . Sweating a lot can be embarrassing for just about anyone. Between uncomfortable clammy hands and awkward sweat stains on clothing, nobody likes to be sweating constantly. But what happens when always sweating is bad enough to be a medical problem? Could you be dealing with hyperhidrosis? Here’s a bit of information about who suffers from hyperhidrosis, and if you might be a good candidate for hyperhidrosis treatment. Hyperhidrosis can affect just about anyone, but certain ages are more prone to the condition than others. Hyperhidrosis affects men and women equally, and most commonly occurs among people aged 25 to 64 years. 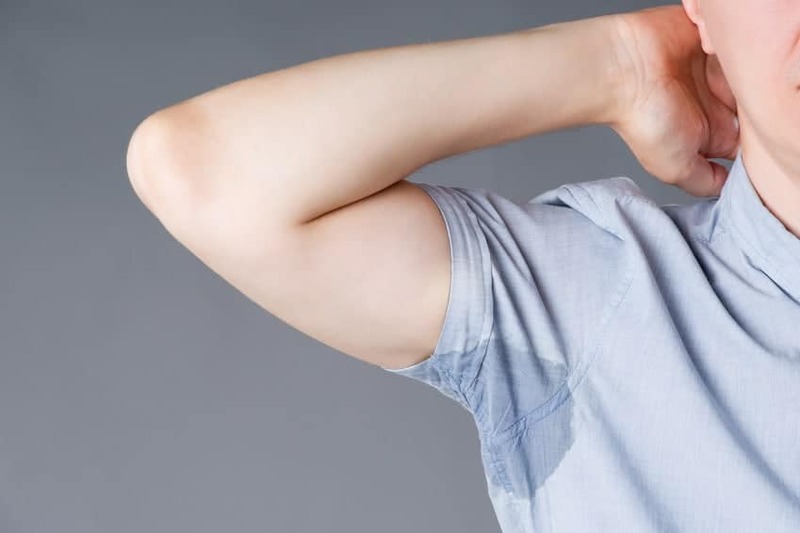 Generally, the condition doesn’t develop until adulthood, so it’s unlikely children will experience a problem with excessive sweating due to hyperhidrosis. 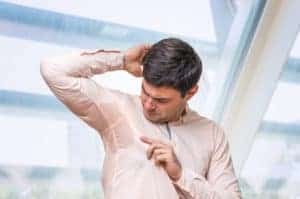 If someone in your family has started accessing hyperhidrosis treatment and you also have dealt with excessive sweating, there’s a chance the two could be connected. 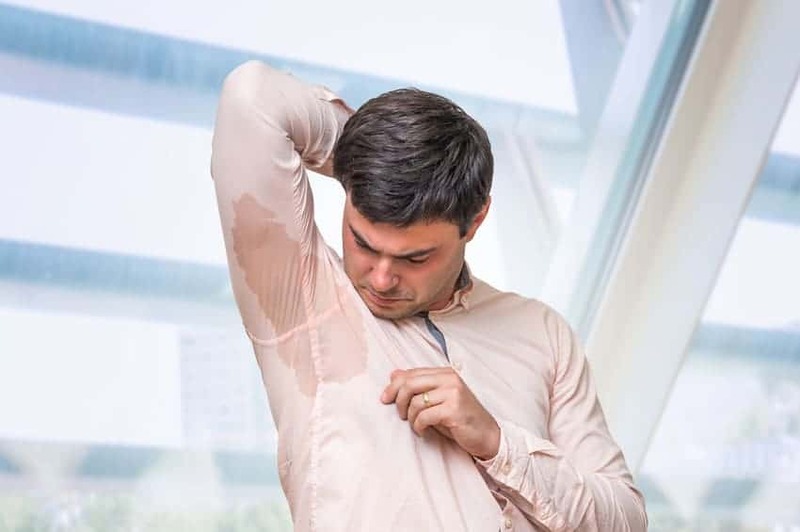 Sometimes, family members of those who have started treatment for hyperhidrosis also deal with excessive sweating problems, suggesting that it’s possible to be genetically predisposed to the condition. However, it’s still uncertain if this is a cause or simply a coincidence. Should You Seek Hyperhidrosis Treatment? Whether you actively look for treatment for your hyperhidrosis really depends on how much your sweating levels affect your day to day life. If you’re sweating enough to the point where it’s interfering with your ability to perform daily tasks or complete jobs at work, it’s likely you’ll need to seek treatment. However, the decision largely depends on what you feel comfortable with. Ask your doctor about whether you should start pursuing treatment for your heavy sweating, especially if it has begun to cause problems for you on a regular basis. If you do start looking for treatment, one of the options your doctor may recommend is an iontophoresis machine. Iontophoresis machines use small amounts of electricity to help control the sweat glands and reduce excessive sweating both temporarily and long-term. Hidrex USA provides iontophoresis machines for doctors and patients to help reduce the problems associated with hyperhidrosis. Contact Hidrex USA today for more information on this particular hyperhidrosis treatment option. Iontophoresis 101: What Is Iontophoresis? Hyperhidrosis is a surprisingly common condition that affects many people on a daily basis. This condition may have you always sweating, causing clammy hands, daily discomfort, and lower confidence levels. If you find yourself looking to prevent sweating caused by hyperhidrosis, one treatment may be particularly helpful: iontophoresis. But what is an iontophoresis machine, and how can it help you stop the sweat? What Is An Iontophoresis Machine? Iontophoresis machines use small electrical currents to reduce sweating in the affected areas of the body. Patients submerge the hands, feet, or other areas of the body in shallow water, and the electrical current reduces sweat in these areas both in the short- and long-term. Patients typically feel a slight tingling sensation during treatment, but the electrical current used is not enough to shock the patient. This common treatment for hyperhidrosis was first used roughly 50 years ago and continues to be one of the most effective treatments for hyperhidrosis today. Iontophoresis can be especially helpful for those who have sought out other treatment for hyperhidrosis, only to still have a problem with irritating symptoms, including constant sweating. Iontophoresis machines are often recommended by doctors, but each case will be different. However, many people have found iontophoresis treatment to be effective in reducing hyperhidrosis symptoms, especially excessive sweating problems. Those suffering from severe hyperhidrosis may need two to three iontophoresis treatments per week when starting out, but the individual treatment regimen will depend on the severity of symptoms. Because iontophoresis uses electricity to shut down some of the body’s sweat glands, treatments may be able to help reduce sweating long-term, even after treatment sessions. For those unable to make use of other hyperhidrosis treatments, iontophoresis can be an effective means of reducing daily sweating issues with few side effects. Iontophoresis has helped many people stop excessive sweating, and can be an incredibly effective treatment for hyperhidrosis if doctor’s recommendations are followed appropriately. Looking for iontophoresis machines to help you stop excessive sweating? Hidrex USA can help you find an iontophoresis machine that will be effective at reducing your hyperhidrosis symptoms if sweating a lot becomes a problem in your daily life. Contact Hidrex USA today for more information. 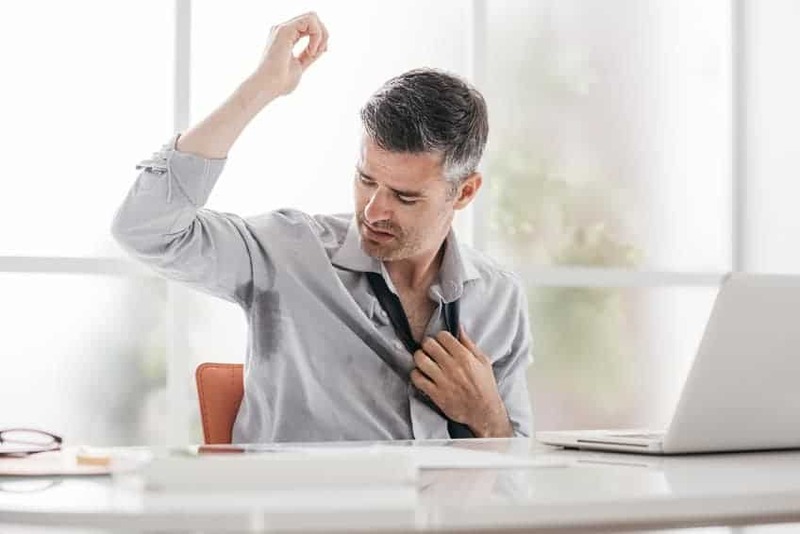 Excessive sweating can be an embarrassing problem; whether you’re sweating through clothes at an important meeting, dropping items due to slippery hands, or just want to make a good first impression, constant sweating can be a real nuisance. However, it’s possible that there’s a hidden cause of excessive sweating you’re missing. Here’s what to look for to figure out if your heavy sweating is caused by a form of hyperhidrosis. Hyperhidrosis, while not necessarily the most well-known condition, is surprisingly common. One type of hyperhidrosis called primary focal hyperhidrosis is the most common cause of excessive sweating and affects between one and three percent of the population. This condition often arises around puberty, but may also appear earlier or later depending on circumstances and the individual in question. Hyperhidrosis specifically causes individuals to be sweating constantly, which can cause issues in daily life. Sometimes the condition is constant, causing people to constantly sweat regardless of the temperature or surrounding circumstances that would normally regulate sweat in most of the population. However, sometimes hyperhidrosis can worsen as a result of specific triggers, such as emotional states, temperature, and more. While many people deal with hyperhidrosis, not everyone seeks out treatment for it. Whether you seek treatment is largely dependent on how much hyperhidrosis impacts your daily life. If you find that hyperhidrosis is making life difficult or complicated, there are several treatment options available. There are several options that exist to help you stop the sweat. Some people opt for medication, but due to side effects, this method of treatment won’t work for everyone. Another option is iontophoresis, where small electrical currents are used to reduce sweating. If used long-term, this hyperhidrosis treatment can reduce excessive sweating or stop it altogether. Looking for more information about the cause of excessive sweating or possible treatments? Contact Hidrex USA today for more information on hyperhidrosis, iontophoresis devices, and more. Be sure to ask your doctor before you start seeking treatment for hyperhidrosis, to ensure that the treatment method you choose is the best possible treatment for you and your situation.